Create beautiful pain-free, temporary body art with this freestyle henna tattoo kit. A tattoo is a big commitment. That unicorn riding a lightning bolt might seem like a great idea now, but will you love it as much in 20 years? 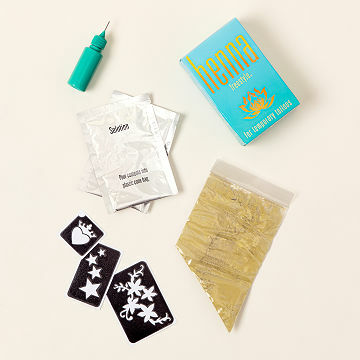 Give body art a try without going under the needle with this freestyle henna kit. It comes with everything you need to get inked (in the painless, temporary way), including enough henna to create 20-30 designs, a bottle with the same applicator tip used by pro henna artists, and three easy-to-apply stencils. Mix the pre-portioned henna powder to make a paste, then create your own designs or stencil your way to tattoos that stay on skin for 7-10 days. (And don't forget to tag us on Instagram if you do draw that daredevil unicorn. It is a pretty good tat idea! #MyUncommonGoods) Made in California. Soak applicator tip in hot water after use to avoid clogging. Use Q-tips to wipe away mistakes and toothpicks to even out lines. Use straight pin or needle to clean or unclog metal tip. If you are going to bed with henna paste still on, wrap area with bathroom tissue and tape to avoid staining sheets. Henna permanently stains wood, fabric, and fingernails. Before using Earth Henna paste, test product on small area first. Place a small amount of product on the skin; leave on for 2–3 hours and rinse off with water. Wait 4–5 hours before proceeding. If you are taking any medications, or have any known allergies, check with your doctor before using Earth Henna paste. All persons using Earth Henna paste should check the ingredients list for potential allergic reactions. For external use only. Earth Henna paste should not be taken internally. Next best thing to a real tattoo! I bought this for my niece whose mom just became a yoga instructor. She absolutely loves it!! It comes with henna powder and a liquid solution that you pour into the henna bag. That's how you make the paste. Then you squeeze the paste into the applicator bottle and start drawing. Great consistency. Whatever paste you have left can be refrigerated or frozen for later use. I never did henna before and that kit was very easy to use. I particularly loved the stencils that made it so easy to get the perfect design but I also did a few free handed designs that turned out great!